So you are about to go on that big family holiday? Or you might be traveling interstate or overseas for work? Either way chances are you already set an out of office reply for your email. Usually we turn on our OOF message to set an expectation that you will not be as quick (or will not) respond to communication whilst we are away. So how do we do that in our enterprise social network – especially where we may participate in our home community, no rx as well as other external networks? There is no “built in” out of office functionality in Yammer – and to be honest an auto-reply style out of office message like your email one wouldn’t work all that well in a community. But remember this isn’t about sending emails to people after they try to get in touch with you – it is about setting an expectation that you will be a bit slow in participating in the conversation. What I like about this is that wherever you see that individual’s name within your Yammer network, myocarditis or the network you are participating in, you know straight away that you will not get a reply straight away – and alternatively if you are in the city they are, you know you have a great chance to catch up in person. So how do you set up your “Yammer Out of Office”? All we are doing is just changing our surname in our profile. 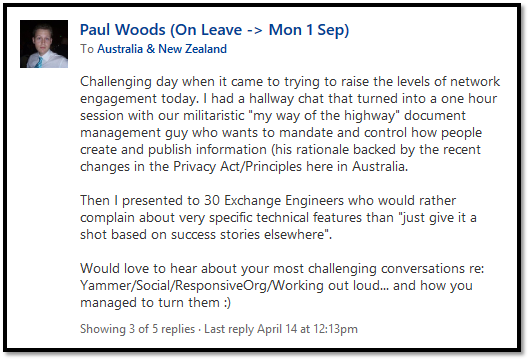 Now everywhere in Yammer where I have posted, where I am mentioned, or even my search results all include my little out of office message. Just like this.. It is as simple as that. 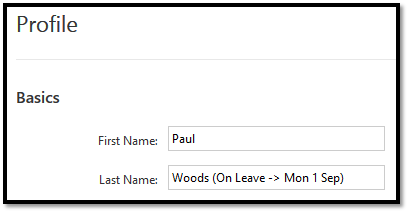 To turn your “out of office” off again, just repeat the process, but just leave your surname in the “Last Name” field.